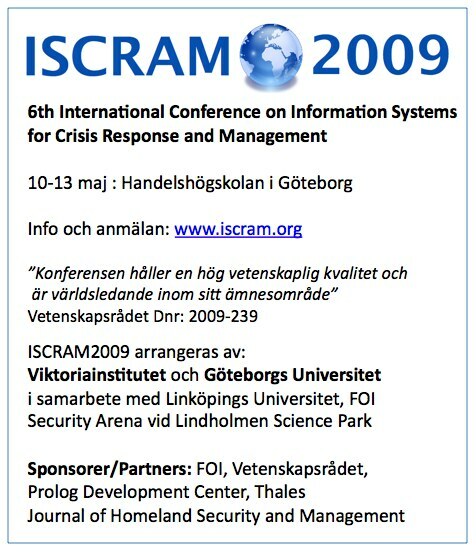 ISCRAM2009 i en stad nära dig. On friday night, I had an interview with a fire crew commander at a local fire station in Gothenburg. We had a conversation about what qualities a mobile system for emergency response work could provide. In contrast to the more typical aspects such as faster response work and safer response work, this fire crew commander identified “credibility” as one such important quality. 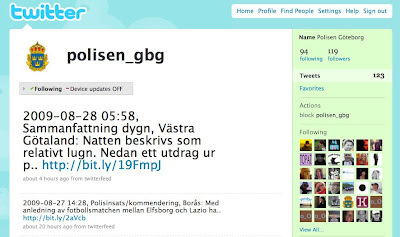 The argument was that now days when every organization by law is requested to provide documentation about the organization’s accident prevention activities and potential risks in the organization facilities, – would it not be a risk to loose credibility if the first responders does not have access to part of that information. The documentation provided by the organization includes risks and specific locations and material that the first responders shall make effort to protect in case of emergency. If the organization is providing this information to the fire and rescue services( FRS), but the FRS fails to make available such information in response work, then why should the organization provide such information in the first place. Whenever information in is delivered to the FRS, the sender of that information is typically expecting the FRS to be aware and act according to that information. The fire crew commander expressed that if we do not have access to such information in the early phases of the response work, our credibility will severely damaged and we will look unprofessional. A mobile system providing support for the operative response work will improve or at least not decrease our (FRS) credibility. However, if the system will fail to deliver such information, then we have huge problems that will take time to repair. The conversation, that I had with the fire crew commander illustrates the complexity in providing information technology to such work. Political decisions in one part of the organization have consequences for a different part of the organization. Such complex interrelated consequences are hard to investigate and typically very hard to plan for. I hope that this example will provide some insights that potentially could trigger reflections when introducing or planning to introducing information technology and information systems in fire and rescue services.